I interviewed most of the guys in Whitesnake when the band visited Stockholm for the first time on May 7th 1981, and this is the chat I had with Jon Lord (I posted the interview I did with David Coverdale quite recently on this blog). I had the Deep Purple Freak Society club going at the time and I recall that a guy at EMI wanted to be kind to me – this was my first meeting with an international band – and when you had guys that had been in the mighty Deep Purple in front of you, it opened doors. I certainly realized that there was a lot of fun to be had and I do think it changed my life drastically. A gentleman from Finland (from a radio station I seem to recall) also asked a few questions, I can´t really remember exactly which ones now. Several quotes have been lifted from this interview for books and records (“Phoenix Rising” comes to mind, they in turn probably nicked it from Dave Thompson´s “Smoke On The Water – The Deep Purple Story” book from 2004 – no credit, which pisses me off). The interview was first printed in Deep Purple Magazine issue 23 back in the day. I actually thought that I had put it up here on this blog but a fan from Russia got in touch and asked me to post it (thanks Rad Losev for letting me know, I hope you will enjoy it!). I think this interview is up there with the best, Jon certainly opened up. 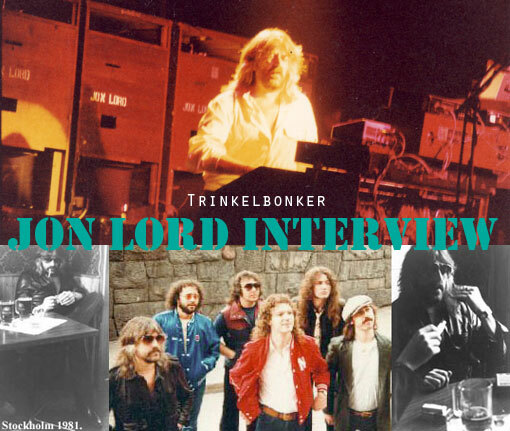 If memory serves me right, I think my old Jon Lord interviews are up on his official site as well. But the time has come to post this on Trinkelbonker now and I certainly think it deserves to be out there. What do you have to say about the Rod Evans Deep Purple con? – Yes, to them it would have been a disaster. – Yes, because people would have bought it thinking that it had something to do with music. But enough about that. Who says that Whitesnake can not call itself Deep Purple? – David Coverdale, Ian Paice and myself. Basically because the last three years… eh, well Glenn has left the organisation, and Tommy Bolin is dead. So it makes sense to call it something else. We will never use it again either, fancy buying the rights? (laughs). Lets go back to the early days. The infighting you went through in Deep Purple. Who started all that? Was it Ritchie? – Yes, and then came the time when Ritchie started to hide behind his Fuhrer-mask and at that point Ian Gillan started to entertain the thought that it was time to move on and do something else, which in the end he did. It was so sad. We said “Can´t we take six month´s off?”, but Ritchie left anyway. That was Ritchie, which happened later. What reason had Gillan for leaving? “Lack of progression” was mentioned at the time. – No, no, no… but it was easy for him to say that at the time because people would believe him. Progression doesn´t just occour, “Oh God, look how we are progressing!”. It takes time and it happens almost undetected. For instance, it is obvious that quite a lot had happened between “In Rock” and “Machine Head”. But it was easy to claim and it was a time of many problems and opinions, but we lived in each others pockets for quite a while so that should be expected. But you also have to have something in common to live that life. You are supposed to work together and make things happen on that stage. If you can´t do that you have a problem. It seems now that Ian Gillan was very upset after the split. He left the music business for years after Deep Purple. – Ian was a primadonna. On stage he played a primadonna and offstage he was a primadonna. And then Ritchie… eh, I don´t want you to think that there was a problem between Ian and Ritchie, everybody in the band was involved in this. But Ritchie always had a fixed mindset, always with very strong opinions. So he became a primadonna. And when we told him that he was in fact part of a group he used to say “So what?”. So to avoid friction we used to say “OK” a lot. In the end he became the person that people thought was the most important part of Deep Purple, that he somehow personified what was Deep Purple. It was a mistake to give him that. But I think he was quite bored with rock when Ian left, which happened in Japan in August 1973. But Ian Paice and myself tried to perk him up. At that point we had seen Glenn Hughes in Trapeze. He was a fantastic singer. Later, when it became known that we were looking for a new singer we were swamped with tapes. We tried to listen but we really had a hard time finding anything decent. And one day, and I swear that this is true, I picked up a tape and said “If this isn´t any good, forget it”, and it was the tape from David Coverdale. What kind of music was it on the tape? – I´m not sure, it might have been one of his own songs. The song was nothing to remember for very long but the voice was exactly what we wanted. I remember that there was a horn section and that you could hear people talk. So we made another two albums and then it all repeated itself. Did you really want to continue when Ritchie left? – We were under pressure. The office, the record company, the publishment company. And surely there had to be somebody out there in this big world that could fit us well. We had always been a hard working band, because that was the way that we wanted it to be. When Ritchie left in, eh, 1975, we had been working like that for seven years, which is a long time. We were living in California and David had heard Tommy Bolin play and he said “He is amazing, unbelievable”. So we asked him to come over for a jam and he said “Yeah, I would love to man” and he came over, with colored hair and things in it, and with this amazingly beautiful woman with him… and we all said “He´s in the band!” (laughs). She was so amazing, we all said “Can we borrow her for half an hour?” (laughs). He played with us and it was great. How well did he function in the band? Was it as good as it had been? He hadn´t been a junkie? – Yes. We didn´t know that he had problems and how could we have known? And that was the sad ending of the whole thing. I mean, he was so talented, he could be brilliant. Some nights he could stand there below the spotlight and he could be amazing, a wonderful run could come from nowhere. He was an active person, young, good looking. It could have worked, had it not been for the problem with the arm. Did people want Deep Purple to carry on even after that split? – Yes, actually they did. But we said “Look, we have given this everything that we can, we have given you eight years of sweat and hard work”, and that was it. But we never said “Never again”, we just put it to the side. “Let Deep Purple rest for a while”. – I honestly don´t know. Nothing has emerged from this band. I mean, David, Ian and myself has even publicly declared that we are not interested in reforming Deep Purple and that we don´t want people to think that it comes from us. But maybe a certain guitarist that has a habit of wearing funny black hats and lives in Connecticut… maybe the rumours are coming from Connecticut? I really don´t want to see a reunion for the wrong reasons. The only thing I have heard so far is people saying “Hey, we are going to make a lot of money… lots and lots of money”. But I have made enough. I´m not a millionaire, but my life is OK. I live a comfortable life and I enjoy myself in Whitesnake. I don´t want to see Whitesnake killed off just… and I don´t want to play those songs anymore. It would be like taking a step back and that doesn´t interest me. What do you think of some of these records that we see now, like “In Concert”? – We have no control over that at all. We have tried and Ian Paice did some re-mixing for the compilation “Deepest Purple”, but they would have released that anyway. So now we say “OK, so you are going to release a new album? Then let us know about it so that we can give you our help, a new mix or whatever”. Because it has all been released, there´s nothing left in the bag. How about “Last Concert In Japan”? – You mean the one with Tommy? Yes. Word is he couldn´t even perform that night, and now people can buy that. – Money, money, money. We have no control over these songs until, eh, 1987, and then it´s “Bye bye Deep Purple”. There is talk about releasing some bootlegs now. – Yes, and in a way you could say that it is very flattering. It means that we had great success and that it meant something. My personal advise to anyone that is going to buy one of these titles is, check it out in the store, listen to the quality of the sound, look for the source… because it could be a load of crap. Sorry, eh, rubbish! How about a few words on Tony Ashton that was involved in your next project? – Oh, I love him, he is my favourite. – Eh, Tony´s life would make a great movie. A series of disasters. He went broke, which was very sad. He never thought that the tax people was for real, thought they were a fairy tale, which they are not. And one day he had them at his door. – In 1969, we shared the same management company. I still think that Tony is one of the finest performers Britain has ever had. But he had this nervous breakdown, which is why we had to stop the Paice Ashton Lord thing. He was just a nervous wreck. He couldn´t face the public again. He is writing music and doing advertising work today, and I think he is happy doing that. It could all change one day, he has written some music that could well be a huge deal when it comes out. How was the breakup of PAL? – As I said he had lost it by then. We were going to record a second album but then he didn´t even work in the studio anymore. Ian Paice and myself paid the bills and it was a lot of money. Did you want to form a new band after that? – PAL finished in 1977 and I didn´t do anything until 1978. – Sure, but I had a nervous breakdown as well. I sat at home and felt sorry for myself. And the longer you do that the harder it is to walk out that door again. I stopped writing, playing, listen. It happens to a lot of people. So did you view Whitesnake as a chance to rehabilitate yourself? – (laughs) I hope not. I have always been a good friend with David, apart from a little fight that we had once in a German magazine, which meant nothing. You don´t like to write songs? – I don´t think of myself as a great rock´n´roll writer. With a guitar you can come up with a decent riff in minutes. You can´t do that with keyboards. – I have written music for another solo album. I´m very interested in English music from 1600-1800. I´ll try to utilise those influences and incorporate them in a more modern way. I have no expectations that it will sell, I just hope that it will pay for itself. Cozy Powell and Simon Phillips are going to play on it. I was going to use Bonzo from Led Zeppelin but of course that is impossible now. The songs will feature different stars and it is all written. I don´t know when I will have the time to do it. Which is the same old problem that I always used to have. But I didn´t do anything for two years and that was hell. As long as my legs will allow it I will continue to tour. It has nothing to do with age, if you have the energy and the will it will not be a problem. But you have to convince yourself that you really want to go up on that stage and make people happy. To make them sing. It has to have some meaning. If you have that self confidence, you´re fine. You said in an interview once that playing extended solos bored you. How do you view this today? – I play a short solo now as well, but not Bach and Tscaikovsky because I don´t think that the people want to hear that. How about playing something from “Sarabande”? – I usually listen to what the bassplayer and the drummer is doing and then anything goes, which is a step back to how it used to be in the early days when rock´n´roll was one with improvisation. I find that interesting, it´s a challenge. – Not necesserily, but something is going on that keeps you awake (laughs). But sometimes everything works out great and that is wonderful. Today, I want to stick to the traditional role of a keyboardplayer – and this is not my idea or anybody elses – I just want to roam inside the big picture. And on top of that the drums, the guitars and the bass can deliver. It is like a huge orchestra. But I always looked at the keyboards as something of a small orchestra. We´ll see tonight if you agree with me. What is it like to work with Ian Paice, who surely is the best drummer in rock? – I have always said that I have considered myself lucky to work with Ian. You can´t be in top shape every night. Maybe the journey have tired you, or maybe you feel a bit ill. OK, you may want to appear to be in good spririt, but there are bad nights. You know, up with the arm and “Hey, hey”, but you feel bad. But Ian is always so full of energy, “Come on, yeah, push, push…”. I have worked with a lot of drummers but nobody has his enthusiasm. That´s why I love him. Yes, he worked hard even on that final UK tour of England with Deep Purple, when the rest of you had given up. – Yes, but then we had a drug addict on one side of the stage and an alcoholic on the other, and Glenn was pissed out of his mind. Is it true that Ritchie wanted you to join Rainbow? And it doesn´t interest you at all? Would you use him on your album then? – Sure, but then he would have to do what I told him to do (laughs). I really don´t want to be a background musician, and I wouldn´t even be sure that I had a job because he fires people more often than he changes his underwear. You would never know who would be in the band, whom you would socialise with. Because it wouldn´t be with Ritchie, you never see him. It could be Freddie Mercury. I will never understand why he had to change it. Cozy Powell was a great drummer and Graham Bonnet is an amazing singer. I considered that band to be a very good one. He should have kept it. I just did some work for Graham´s solo album and he told me that the problem with Ritchie was that he kept telling him how to sing all the time. David Coverdale has said that he thinks that Ritchie may end up being the Frank Sinatra of rock´n´roll. – (laughs). That´s funny, it could happen. He never changes his style. – No, but he changes the band, but not the music. But I don´t want you to think that I have anything against Ritchie, that´s not true and I like him. I find him very hard to work with but I like him. I also have great respect for his talent, but it hasn´t moved in the last five years. He plays pretty much what he played back in 1975 but in my opinion not as good. And I think I know why. He doesn´t have to fight anymore. The moment he encounters another opinion, he change the band. So the energy might get lost in that situation. He just avoids conflict now, like the one he had with me in Deep Purple. I wasn´t about to let him have all the spotlight and that resulted in all the duels that we had, which became a trademark for Deep Purple. He doesn´t have that now in Rainbow. The only guy that used to be like that in Rainbow was Cozy Powell. Do you think that Deep Purple still had that energy when Tommy Bolin was in the band? – When he could play, yes. But that was like one night out of five. It was a sad period and I really don´t like to talk about it very much. – He destroyed himself and that was a tragedy. But Ritchie annoys me, he doesn´t try hard enough. He doesn´t give anybody a chance to inspire him. He always wanted to be on top of the world and now it continues. It was sad that he had to leave Deep Purple. Thank you very much. dear Mike!! !